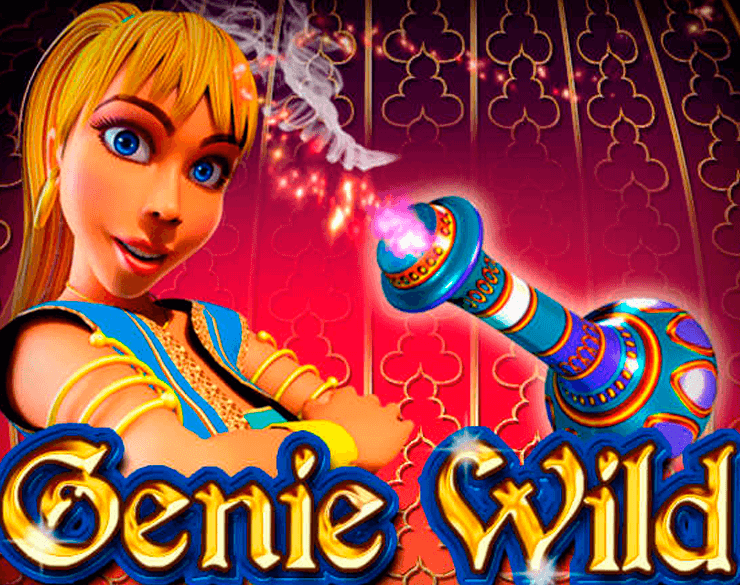 Enter the Genie’s kingdom and discover the world of magic with Esmerelda the beautiful blonde genie girl who will grant your wish of free spins and bonus wilds. This mystique of this classic 5 reel slots will have you returning for more and more. Have fun as you play our online slot casino today! In 1994 Microgaming created their first online casino. With new releases, every month Microgaming keeps growing their selection of games to choose from. This way their audience will never get bored as there are always new high-quality games to discover. So far Microgaming has developed more than 850 unique casino games, including 1,200 variants. Microgaming gives great value to always be up to date with the newest technologies so that they can deliver products with the highest quality standards to their audience. For other game creations, view slot games here now. 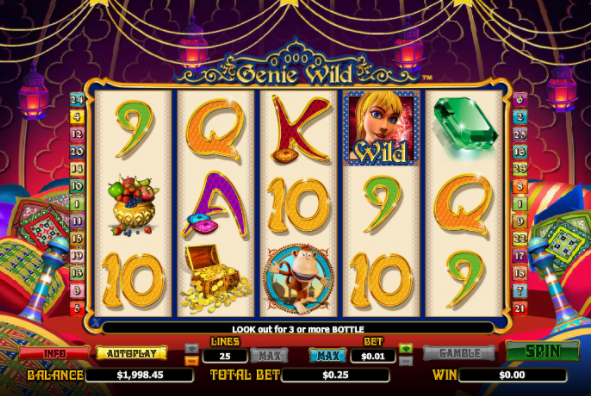 Genie Wild is an ancient Arabic themed online slot game that expresses a great game feel to the adequate art style and soundtrack. You will find yourself inside of a luxurious tent filled with atmospheric red lights coming from the beautiful lamps hanging in the tent. You will be welcomed to sit down on one of the comfortable and rich colourful cushions lying around everywhere. 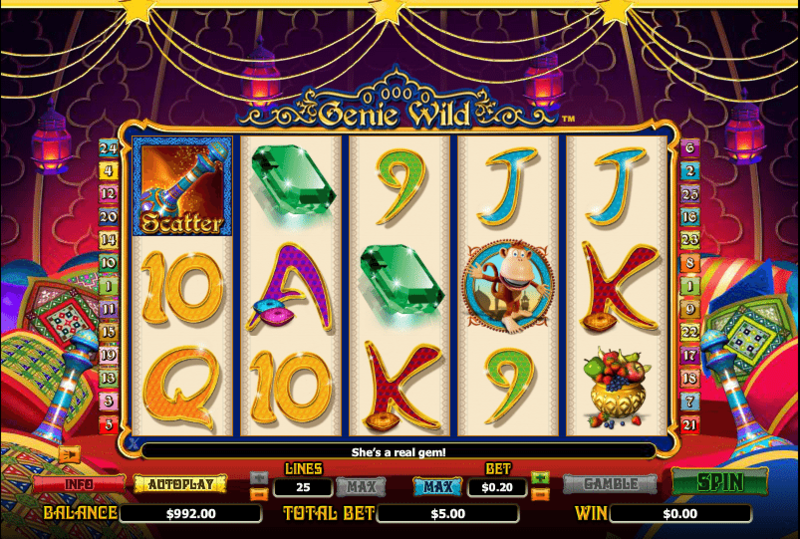 Genie Wild brings a magical experience, making it one of the best-rated online slots of our time! Once you have made yourself comfortable you can start your game and discover the symbols on the five reels and three rows. You will find a tasteful bowl of fruit, a shiny green gem, a chest overflowing with gold coins and a happy monkey on the reels. You are also presented with the lower value symbols A, Q, K, J, and 10. To add a little magic to the game, it also includes a scatter and wild symbol. Look out for the Genie as she will replace everything but the scatter increasing your chances of fortune. The scatter is represented by the Genie's home, the bottle. Land three or more anywhere on the reels and you will be rewarded with ten free spins. During the bonus rounds, the Genie will be most powerful and turn into an expanding wild whenever you will land the wild in a free spin. Unfortunately, this feature can´t be retriggered during the free spins period. After a win, you will also have the chance to enter the thrilling gamble feature. To activate the feature you just have to click the “Gamble” button in the bottom right-hand corner below the reels. If you manage to guess right the colour of the next playing card you can double your win. If you predict the suit of the card right you will quadruple the win. To buy yourself a bottle with a Genie inside you have to place a minimum bet of 1p or up to 6.25 pounds. 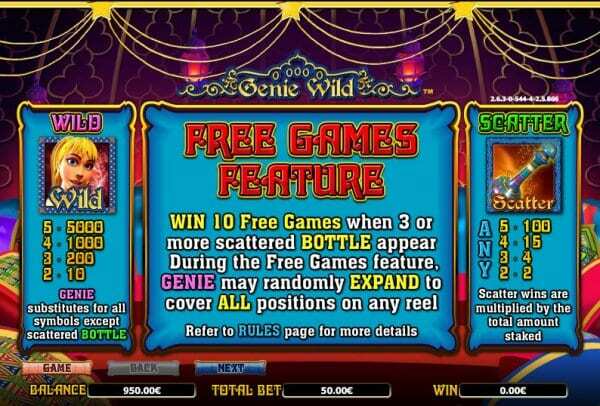 The Genie will help you to complete any of the 25 paylines and with the free spins, you may land a very profitable spin. Genie Wild will welcome you into this magical ancient Arabic themed world and make your evening a little more exciting. Sit down in the comfortable tent and see how the expanding wilds during the free spins feature will make this game much more lucrative. The art style expresses the luxurious Arab world very well, immersing you into the beautiful scene in which this game takes place. Make your wish and let the Genie help you make it come true. Another top game to try is twin spin.